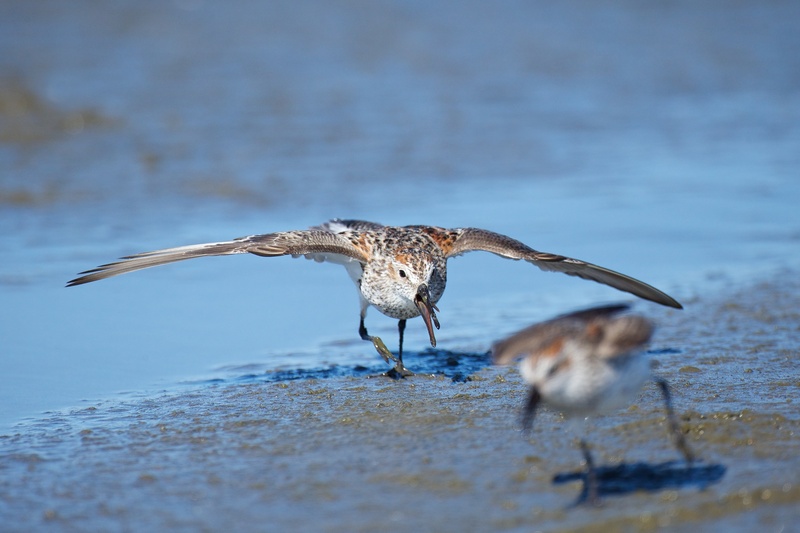 On the Washington Coast, photographer Gregg Thompson witnessed a couple of Western Sandpipers fighting, well away from their Arctic breeding grounds. Western Sandpipers are aggressively territorial, more so than any of the dozen species of related shorebirds that also breed in Alaska. From Birds of North America Online: Most fights occur [are] between two males who charge each other from crouched postures. The birds then flutter into the air, to a height of several meters. As they rise, they use their wings to slap at each other, and jab with their bills. Their feet are held up and directed towards the opponent. Feathers are often torn loose. Both birds then land, engage each other again and repeat the charge and fluttering fighting. Most fights only last a few seconds.